It’s been over a month ago since I’ve colored two drawings from the color by number coloring book Colourtronic (a.o. for sale at Bol.com), so it’s about time to write a review. The book was published by BBNC Publishers and they’ve sent it to me (also for KvV). I’d like to thank them very much, by means of this review. 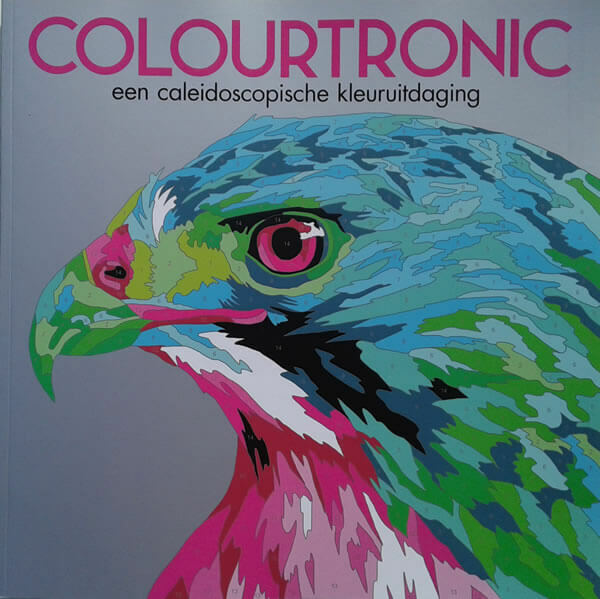 Colourtronic is a pretty new book, in Dutch it was only released in 2017 and in English in 2016. 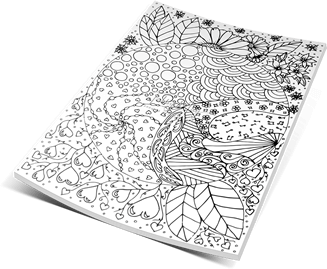 Its size is wonderfully large with 29 x 29 cm. The paper is white and fairly sturdy and it is single sided printed. I’m very glad there are more and more books published that are single sided printed, since that definitely is my preference. From the 29 drawings the book contains it wasn’t very easy to pick one to start with. First off all because I never color by number, so I had to make a mental switch and set my mind to a different way of coloring. Secondly because the drawings look so totally different compared to my usual coloring books. Everything is divided in compartments with a number in it. The numbers correspond with the colors in the circles on the side of the page. And that was another challenge: finding the right colors. Let us first take a look on the inside of the book, so you’ll see what I’m talking about. 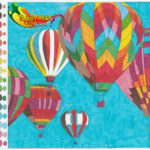 My choice for a first drawing from Colourtronic was the picture of the hot air balloons. They always appeal to my imagination and this drawing reminded me of a yearly event in a town I lived in years ago in the Netherlands, called Zutphen. The event was ‘Zutphen Ballooning’ and this memory is about fifteen years ago. I started with deciding what materials I would use to color, not quite unimportant. I wanted a material with a wide variety in different colors and I wanted it to be a fast material. Since I was pretty reluctant about starting this project. I finally chose the Sharpies, and a couple of Twinmarkers to complement some missing colors. Next to the printed colored circles, with the numbers in them, I’ve added my own colored circles with the markers and wrote the numbers of the markers in them with a white gel pen. That way I wouldn’t get confused which marker belonged to which number in the drawing. And then I could start. I’ve started nicely in the right order. First number 1, number 2, but at one point I’ve started working more per balloon. I kind of got frustrated when I thought I had all the blocks of one color covered. And then again another one popped into my sight that I had forgotten. 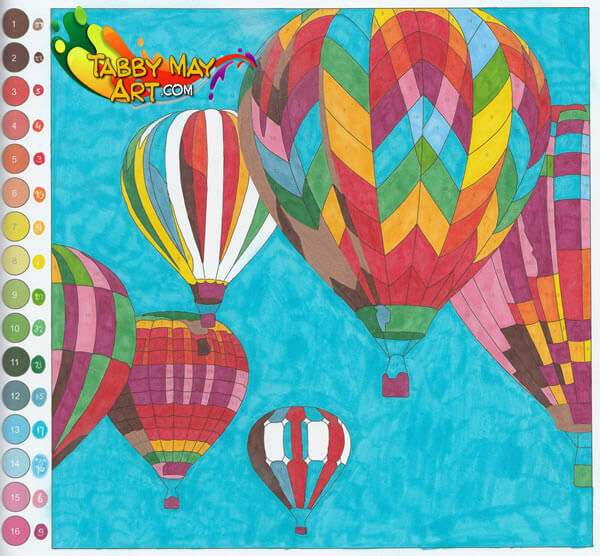 When finally all the hot air balloons were finished I started coloring the sky. In the end that turned out way too blotchy to my liking, despite coloring with alcohol markers. The paper rapidly absorbed the ink from the markers, which was a disadvantage I hadn’t factored in. Maybe working with alcohol markers in this book wasn’t such a great choice after all. Furthermore I thought this way of coloring was quite dull, not much else that filling up compartments with color. When this design was colored I was glad that I had managed to bring it to an end. I wasn’t very pleased with the end result, to my taste it’s a bit messy with all these colors… it definitely wouldn’t have been my choice of colors. And that made me decide to do another one in this book, but with a totally different approach. 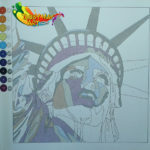 For the second one I’ve picked the drawing of the Statue of Liberty in New York (USA). The specified colors didn’t appeal to me at all, so I looked where the shadows should be and picked my own dark colors. And for the lighter areas I’ve picked lighter colors. I hoped that using my own choice of colors would give me more fun in coloring in this design and that I would like the end result when I would have finished it. 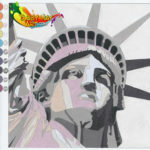 My chosen material to work with this time were the Prismacolor Premier Soft Core colored pencils. I really love working with these pencils, and the paper was much more suited for working with pencil than with markers. So I made a good choice! Just like with the first drawing I’ve colored my own circles next to the printed ones and added the numbers of the pencils. And it was a good thing that I did it that way, else I would have made a lot of mistakes with the several shades of grey that I’ve used. Without writing down the corresponding numbers next to the printed circles this work would have become a total mess! This time again I’ve started with number 1 and continued up to number 10. Because I had chosen my own colors, it felt a lot better. Not so much ‘pre-chewed’. I was looking forward to the end result and what it would look like in comparison to the picture with the intended outcome in the back of the book. 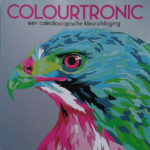 The pencils did a great job on the paper of Colourtronic. One big advantage of the Prismacolor Premier Soft Core pencils is that they’re really very soft. Therefore the color mostly covered the numbers in the drawing. That is one of the biggest drawbacks of these color by number books: the numbers usually stay visible when the work is done. But with these pencils not so much. Because I used several layers the numbers can barely be seen. Finally I was quite satisfied with the outcome. This way, with my own color palette, I at least enjoyed it a lot more. And it was a bit more exciting too, since I had no idea what it eventually would look like. When I saw the end result slowly appearing before me, I actually did like what it had become. But I’m afraid I’ll never become a true fan of color by number drawings, even though the drawings in Colourtronic are very nice. So many men, so many minds. Fortunately! A book like Colourtronic with color by number drawings not quite being my cup of tea, doesn’t mean that other people can’t have enormous fun with it. I know plenty of people who love it to not have to think about anything. 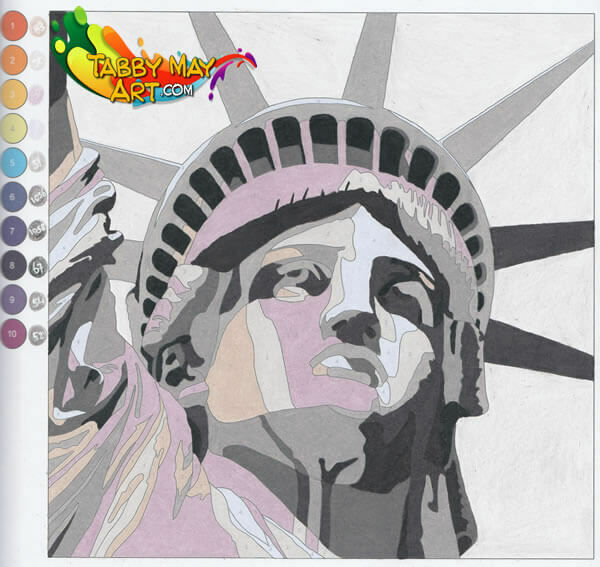 People that can enjoy the coloring in of all the different blocks in a drawing and not having to think about what colors to use. When you’re like that too, then this book is a must-have for you! You can easily order it through Bol.com, for € 11,83 or click the pictures or the link below. The end result and two w.i.p. pictures from this review can be seen here in a larger size (or through the Photo gallery in the top menu). Note: This review contains a product that I’ve received from BBNC Publishers. This however does not reflect on my opinion in any way. Next: Vacation, new coloring stuff… but how to get it home? A travelogue! Wat een goed review.. ik heb ook nooit begrepen wat er leuk is aan kleuren op nummer..